Country like India where the population is very high, Beggary has become common for the peoples; some people have taken it as a profession for their living. We find it more in cities (especially in metro cities) comparing to village. Who is beggar? A person who is begging for food or money we call him a beggar. Why people become a beggar? The physical handicap persons who cant do any work to fulfill their stomach they start begging. But those people who are physically fit, if they start begging it’s a very shameful thing, because of their laziness they don’t do any work for their living & start begging and from their begging, they encourage other people to beg as a very light or without work a part time job. We the people of India the most traditional and devotional people in the name of Dharma and Punya use to distribute food and money to these people. Now who is responsible for such a social evil growing day by day in our society? The lazy persons or we the traditional or devotional people? Obviously we traditional and devotional people of every society are responsible for the prevailing and growing of this disease like beggary, in our country. It is our duty being an Indian, to wipe out this social evil from our society. If really, we have to earn Punya from Daana then we must give to those people who can’t do any work for their living and it’s a true way of devotion, for god. But, unfortunately we don’t do like this and these lazy people increasing day by day and few of them has started it as an organization of beggary and use innocent children, infants ……..to run their business of beggary. Though, the government has taken various steps to eradicate beggary from our society, but not getting any fruitful success. 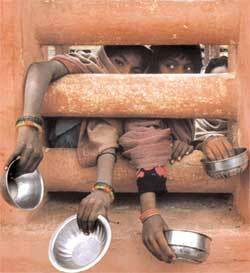 It is the duty of each and every citizen to discourage people from begging. Thus, beggary is nothing but a curse to a healthy society. So, we must do jointly efforts to wipe out it from our country.